This is the last day of the PB 14:14 Challenge…and although I already posted today, I’m going to add an additional post because I missed one day last week. This is one of my all-time favorite books…before it was published, the author read it to kids in schools, libraries and children’s hospitals. When Chester Raccoon complains about going to school for the first time, his wise mother shares a wonderful secret with him of how to carry her love with her wherever he goes. 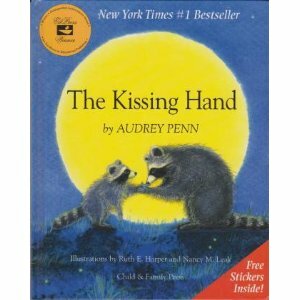 This entry was posted in PB 14:14, Top Ten Elements of Picture Books and tagged 1st day of school, Audrey Penn, Overcoming Anxiety, The Kissing Hand by viviankirkfield. Bookmark the permalink. When I worked with a team teaching kindergarten class, this was one of their favorite books. I’m not surprised, Barbara. 🙂 The theme touches every child as they embark on a new school journey…or any new experience they are anxious about. When I was in second grade I wanted to go to school. My teacher had a pet raccoon and sometimes he’d come visit us. Every raccoon picture book reminds me of that time. Great memories. What a comforting book for children who become anxious about leaving a parent.